Since the 1970’s, Bellingham, WA own member community food co-op. Featuring Tree Frog Farm’s locally produced all natural, alcohol-free Flower Essence Remedy blends, and Aromatherapy/Flower Essence mister sprays only at the new Cordata store. Check out their “locally grown” section. Quality Bulk Herbs, Essential Oils, Tinctures, Flower Essences, Supplements, and More. Dedicated to providing quality organic herbs and botanical products to the discerning customer in the Bellingham, WA area. Physical elements for your spiritual journey. They specialize in the sale of metaphysical and spiritual items, including Tree Frog Farm Aromatherapy Misters. Awaken to who we truly are with frequency. Transformative books, music, crystals and more. Feature Tree Frog Farm products and three proprietary aromatherapy misters: Wise Awakening, Journey Through Nine Dimensions and Prophecy. “The Pearl of Rosario Strait” Puget Sound Washington, USA. Information on Lummi Island events. Sailing schedule of the Whatcom Chief between Lummi Island and Gooseberry Point, Washington, USA. Map and directions to Lummi Island ferry landing at Gooseberry Point, Washington, USA. Listing of contacts for Bed & Breakfast and retreat cabins on The Island, general island information and real estate guide. Vacation rental service for Lummi Island. A fun and educational fair on the beautiful Bastyr University grounds with lots of family activities and music. First Saturday in June. Jamye Price, Energy Healer, bringing your perfection into balance. A Nature Preserve and Meditation Parkland founded by Chuck Pettis. A gathering of humans and fairies to improve relations & assist each other in planetary healing. “Feel-Good” Products from O’Malley & Potter have been formulated to help give you relief, and let you feel good! All products have been tested on real people with real symptoms.No petroleum products or animal-derived products are used. Massage therapy, classes in yoga, massage and holistic health. Natural alternatives for women with health concerns such as menopause, osteoporosis, pregnancy, fertility issues, breast health and cancer prevention. Hundreds of woman-friendly links, a forum to share experiences and lots of information about Susan Weed (herbalist and author of women’s health books) workshops, intensives, apprenticeships, and correspondence courses. See her famous Gaia Goddess artwork and hand-drawn Tarot cards. Joanna Schmidt is a professional animal communicator and Intuitive reader dedicated to providing information in a practical, confidential and grounded way. 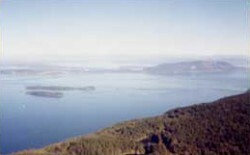 Lummi Island Heritage Trust is a nonprofit organization dedicated to conserving Lummi Island’s farmland, forest land, open space, and undeveloped shorelines. Barbara Berst Adams newest book celebrating the small, sustainable farming movement and the benefits for all Beings with a mention of Tree Frog Farm. Animal telepathic communicator, dear friend and author of “Communicating with Orcas: A Whale’s Perspective”. Network care spinal analysis with Kim Haustedt, D.C. Feeling at ease is natural. Healing leads to personal transformation and growth. Organization promoting U.S. Department of Peace and Department of Peace in governments worldwide. Department’s of Peace promote non-violent strategies to local and world conflict. Music for Peace and Healing Mother Earth- Since 1979, Dean and Dudley Evenson have created music and videos for enjoyment, as tools for health and healing, and as inspiration towards unconditional love of Humankind and Nature. Business Alliance for Local Living Economy. BIMS offers free Buddhist meditation events, classes and instruction in the vipassana Theravada tradiition. It has been supported by voluntary donations since 1989. Intuitive and Energy counselor, Paradigm shifter and on-line radio host extraordinaire. Their mission is to appreciate, conserve and study our native plants and habitats. Membership information, native plant lists, habitat restoration and wild garden resources. Good environmental stewardship begins in our own backyards. Over 35,000 acres of wildlife habitat is converted to housing and other development each year here in Washington. If we continue at this rate, many of our native wildlife species will have few places to live and visit. So the Washington Department of Fish and Wildlife instituted the Backyard Wildlife Sanctuary Program to help offset some of this habitat loss. Free directory of complementary medicine, from Acupressure to Zen, you’ll find worldwide connections to many different forms of healing and enlightenment. Comprehensive Health directory and fitness resource. Specializing in Unique Gifts and Services for Well Being including chakra gemstones, singing bowls, Energy & Sound Healing, fountains, Labyrinths, Feng Shui Products, Energy SourceBook Workshops & Certified Facilitator of Adult Learning on-line course. International quarterly magazine with an extensive online collection of articles on ecology, economics, social justice, health, science and spirituality. WE DO NOT ENDORSE ANY PRODUCTS SOLD BY ANY OF OUR SPONSORED SITES, NOR CAN WE TAKE RESPONSIBILITY FOR THE CONTENT CONTAINED ON THESE SITES. BY CLICKING ON ANY OF THE LINKS YOU ACKNOWLEDGE AND ACCEPT THIS DISCLAIMER.